You can substitute diced apple for the pear. And in the fall when peaches are passed, you might find lovely purple plums to use in their place. Makes 8 to 10 servings. Combine the wine, sugar, Cointreau, vodka, pear, orange, lemon, and lime in a large pitcher and stir to mix. Refrigerate at least 8 hours or overnight. Just before serving, stir the soda into the sangria and add the peach. Serve in wineglasses or tall glasses, adding a few pieces of fruit to each glass. Puff pastry is available in the freezer section of most grocery stores these days. Be sure to plan ahead and allow a day for it to thaw in the refrigerator before using. Most 1-pound packages will hold 2 folded sheets of pastry. When forming the cylinders, it’s important to form the dough into a snug, tight roll to make cutting easier, and ensuring neat pinwheels. Makes 10 to 12 servings. Preheat the oven to 425°F. Line 2 baking sheets with silicone baking mats or parchment paper. Lay 1 of the puff pastry sheets on a lightly floured work surface and roll it out to a 14-inch square (keep the remaining pastry wrapped, in the refrigerator). Stir together the mustard, lemon juice, and olive oil in a small bowl. Brush half of the mustard mixture over the pastry square and cover it with a layer of half the prosciutto, overlapping the slices slightly and leaving a 1/2-inch border of dough open along 1 edge. Sprinkle the prosciutto with half of the provolone and Parmesan cheeses and half of the basil. Roll the pastry tightly up into a cylinder, beginning from the side opposite the bare border. Pinch the seam to seal the roll securely; if the seam doesn’t seem well sealed, dab a little water onto the pastry. Repeat with the remaining pastry and filling ingredients to make another roll. Use a good serrated knife and a gentle sawing motion to cut each of the cylinders into 1/2-inch-thick slices, discarding the end trimmings. Set the slices on the baking sheets at least 11/2 inches apart. Bake the pinwheels for 16 to 18 minutes, or until puffed and lightly browned. If baking both sheets at once, switch pans about halfway through to ensure even cooking. Let the pinwheels sit a few minutes on the baking sheets, then transfer to a wire rack to cool a bit. Serve warm or at room temperature. They’re even tasty the next day, gently rewarmed if you like. Menu Ideas: This is another ideal candidate for a tapas-type spread, perfect finger food for a buffet table, or for passing on platters at a cocktail party. 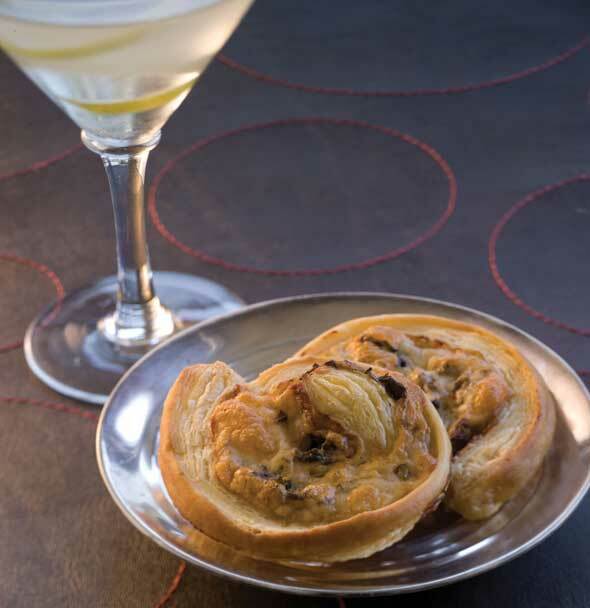 Do-Ahead Tips: You can prepare the pinwheels up to 6 hours in advance, to the point just before baking. Refrigerate them on the baking sheet, covered with plastic wrap (I prop it on top of other things in the refrigerator). Bake them just before serving. Every time I make this for family and friends, I smile as I remember all the fantastic meals shared with Lydie Marshall and her husband Wayne. Lydie, who has a wonderful cooking school in Nyons, France, inspired this dish, which I have enjoyed adapting over the years. Rather than making a tomato sauce for this pasta dish, you stuff fresh tomatoes with a quick and easy blend of cheeses, herbs, and garlic, then roast the tomatoes until they’re tender. Perched on a bed of linguine that’s been tossed with seasoned buttery breadcrumbs, the tomatoes and their cheesy stuffing create an instant sauce as your guests cut into them. Because it makes a bit of a delicious mess in doing so, it’s best to serve the dish alone, in a shallow pasta or soup bowl, rather than on the same plate with other items. You can use Boursin in place of some or all of the goat cheese in the stuffing, if you like. Makes 6 servings. Cut the top 1/2 inch from each tomato, reserving the tops. Using a melon baller or serrated grapefruit spoon, remove the seeds and flesh from the insides, leaving just the tomato shells. Lightly salt the interior of each tomato. Drain them upside down on a few layers of paper towels for 15 minutes. Stir together the goat cheese, mascarpone, milk, chives, thyme, and garlic in a small bowl. Spoon the mixture into each tomato, top with the reserved tomato “lids,” and set in a shallow baking dish. Bake the tomatoes until tender, about 25 minutes. While the tomatoes are baking, bring a large pan of salted water to a boil over high heat. Add the pasta, stirring to separate the strands, and cook for 10 to 12 minutes, until al dente. While the pasta is cooking, heat the butter and oil in a small skillet over medium heat. Add the garlic and cook for a few seconds, then add the breadcrumbs and continue to cook for 2 to 3 minutes, stirring often, until lightly toasted. Remove the skillet from the heat and stir in the parsley; set aside. Drain the pasta well and toss it with the bread crumb mixture in a large bowl. Divide the pasta among 6 warmed pasta bowls, making a nest in each for a tomato. Sprinkle the pasta with the Parmesan cheese and set the stuffed tomatoes on top. Sprinkle the basil over and serve. 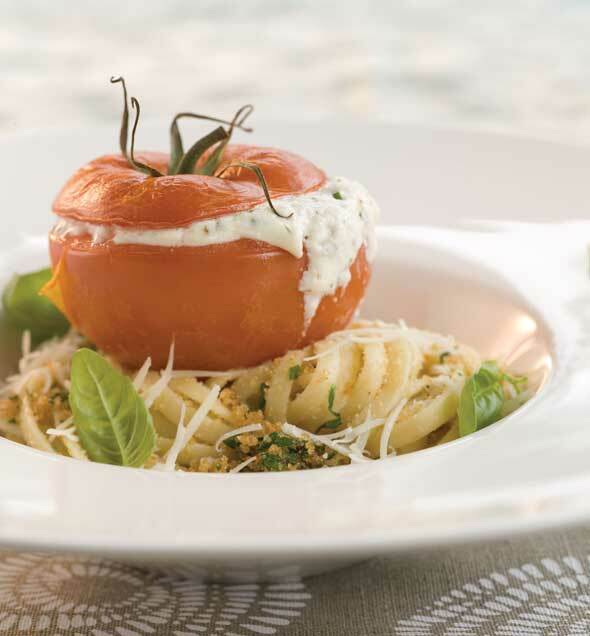 Encourage your guests to cut into their tomato right away to allow the cheese to blend with the pasta. Menu Ideas: This is best served as a solo course, whether a light main course with a salad beforehand, or as a precursor to a simple grilled meat entrée, such as rib eye steaks rubbed with minced fresh oregano. Do-Ahead Tips: The tomatoes can be prepared and stuffed up to 6 hours in advance and refrigerated. They should be baked, and the pasta cooked, just before serving.